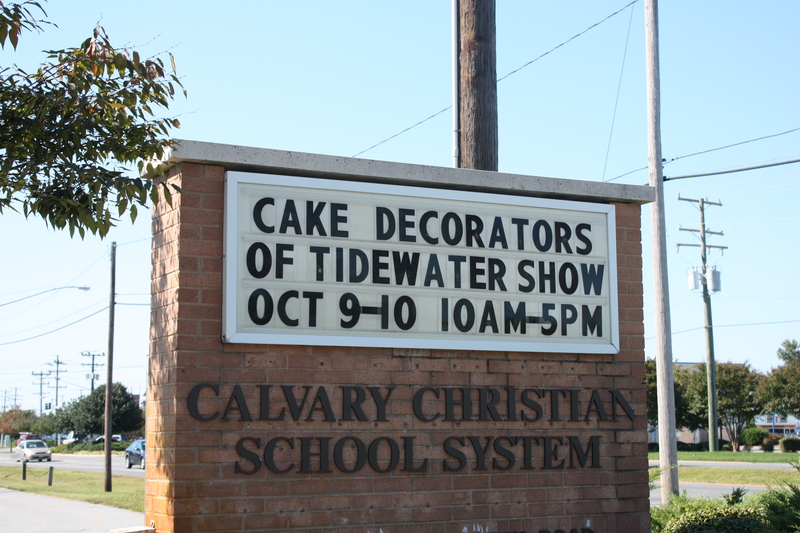 Last month while I was at a local cake store I learned about a cake show that was coming up in our area. I had never been to a cake show before and I thought it would be a great thing to attend and the more I thought about it, the more I wanted to participate! 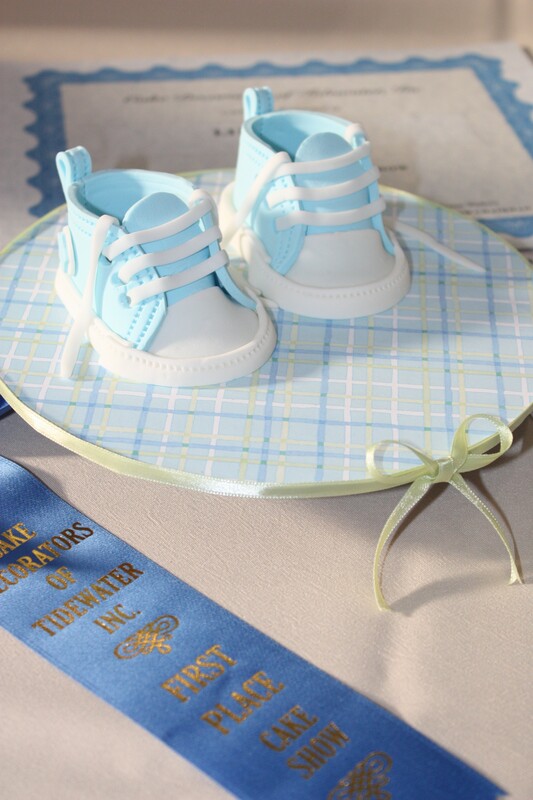 So I decided that I would make a baby shower cake using baby converse shoes as the cake topper. As the date came closer (and I grew more and more tired), I changed my mind. Instead of decorating a cake, I would just submit the shoes I made using fondant and gumpaste. They have a bunch of different categories (from cookies to wedding cakes and everything in between) as well as different divisions (skill levels). So I entered my shoes in the non-cake category under the Intermediate division. Would you like to see how adorable they are?! My 4-year old daughter also participated in the cake show. 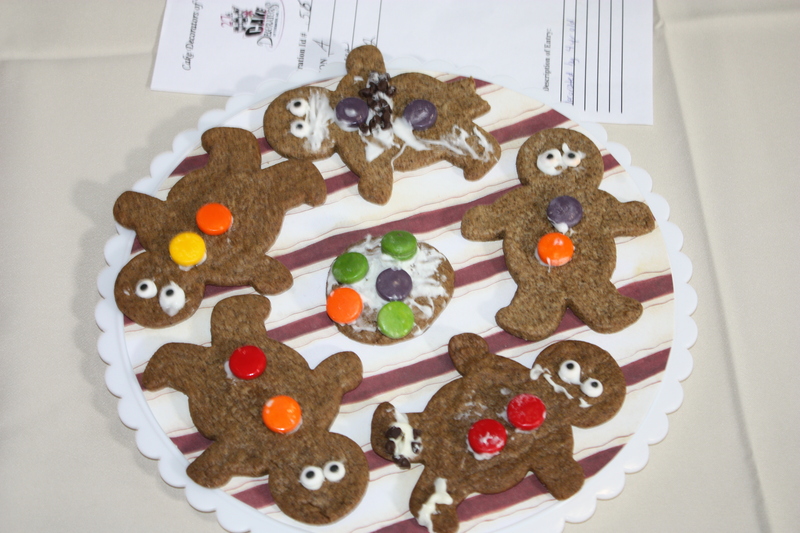 She decorated gingerbread men cookies with melted chocolate and candies. The cake show was a weekend event full of classes and demonstrations. You want to know who was there?! Colette Peters! 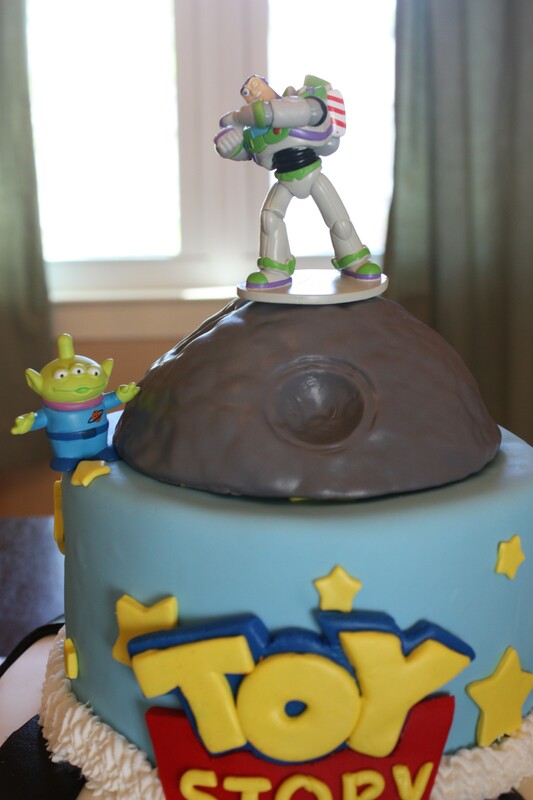 She creates gorgeous cakes and has been on quite a few TV shows for cake challenges. Although I was unable to take her class, she stayed for the awards ceremony and afterwards I asked if I could take her picture with my daughter and she obliged. She was so sweet! 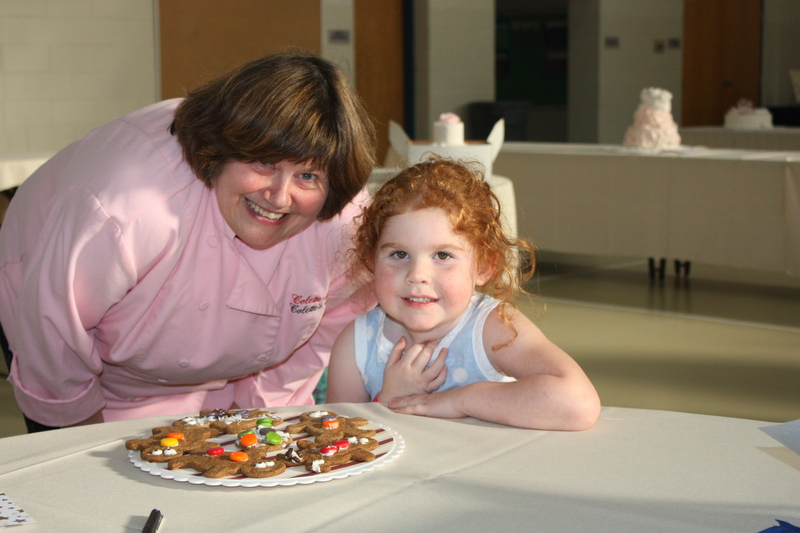 She listened to my daughter as she explained and showed her the cookies that she decorated. It was very sweet. I sure hope that she comes back and teaches more classes! The award ceremony concluded the weekend cake festivities. 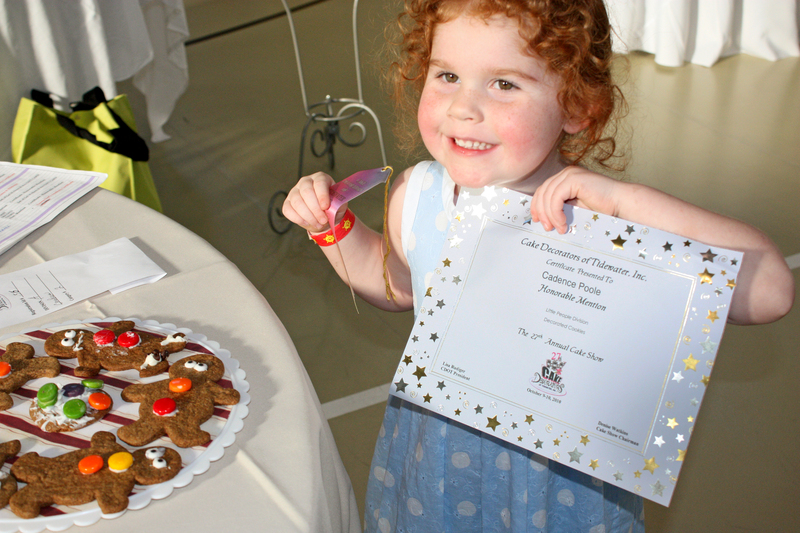 Cadence received an Honorable Mention for her cookies (I was so proud of her!!) and she also won the children’s raffle (a haunted house cookie kit). 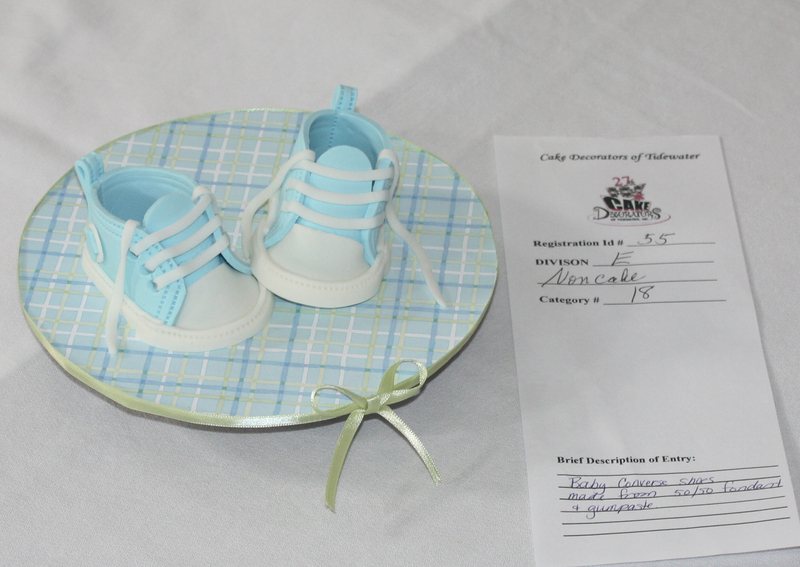 As for me… well… those adorable little shoes won me first place in my category! I was ecstatic!! (You see, after I submitted my shoes, I walked around to the different vendors and saw that someone was selling cutters to make those shoes and I was a little disappointed because I thought that maybe the judges thought that I had made the shoes with those – which I didn’t – I handcut those babies!) So needless to say, whether they thought that or not, they felt that they were worthy of first place! I had a great time at the cake show and I am looking forward to next year! I’m not sure who likes Toy Story more… me or the kids! haha! 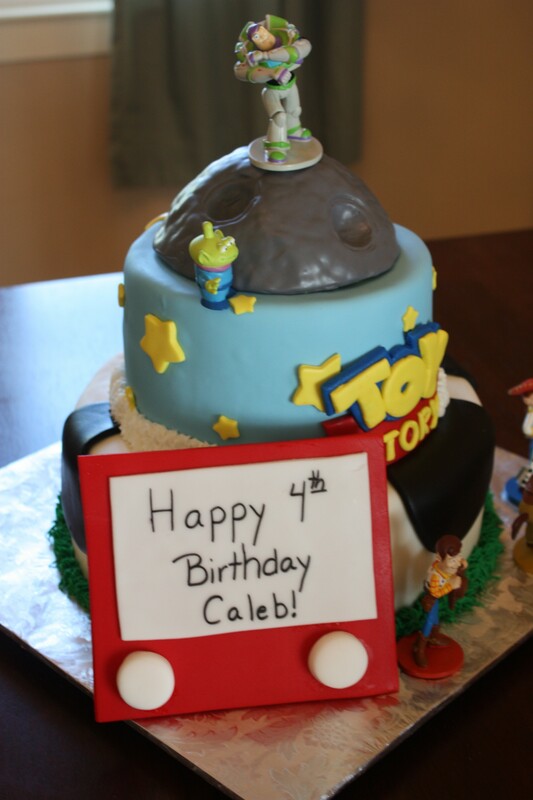 🙂 Here is a cake made for a little boy named Caleb who is celebrating his 4th birthday – Toy Story style! 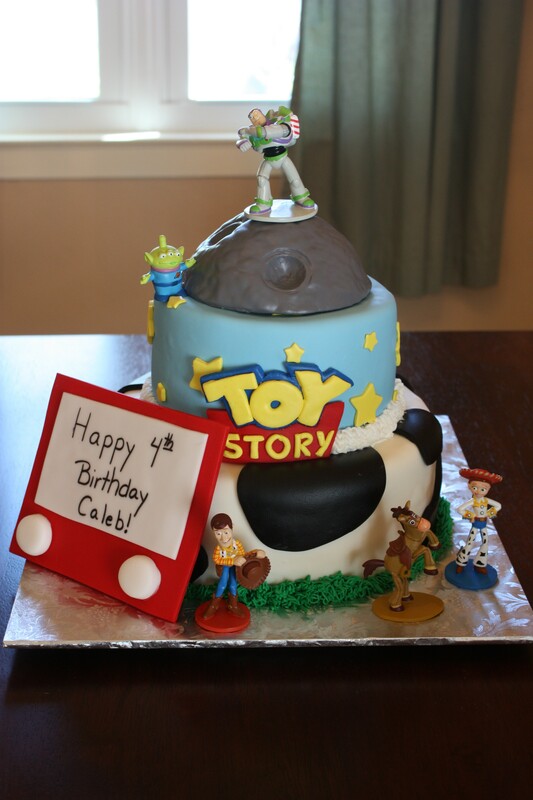 The bottom tier is vanilla (10 inches) and the top is my favorite dark chocolate fudge flavor (7 inches), with buttercream serving as the filling. They are covered with my homemade marshmallow fondant and fondant accents. 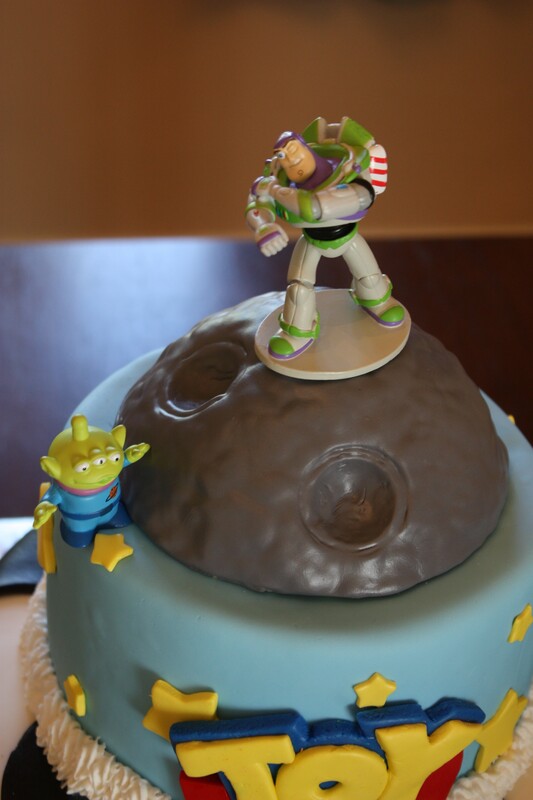 I wanted the crater to look as realistic as possible, so I molded the shape with rice krispies treats – doesn’t it look like Buzz’s spaceship took off from it? The figurines are from the Toy Story 2 playset at the Disney Store.